Hey Ladies, this post focuses on setting up a blog or a website to chronicle your weight loss journey. So, you’re in the process of losing weight and you want to tell the world about your weight loss journey. Not only can you chronicle your progress and keep yourself motivated but you can also share your success and challenges to motivate others. The great thing is that with advertising, affiliate programs and other minimization options, you can make money while blogging (sometimes a little, sometimes a lot with programs like Amazon Associates and Google ads) as well as expand your online brand. GET STARTED Today! Three Quick Steps to Hosting a Weight Loss Blog/Website! What’s the best way to do it? If you’re on Facebook you could create a fan page and hope other users like your page and follow you. That is a great way to start but, you’re only going to reach people who are on members of Facebook, and, believe it or not, not everyone is on Facebook. You can set up a Twitter, Pinterest or Instagram account as well, but again, you need to consider how you’re limiting your audience. So, how about a website or a blog? That way anyone with an internet connection has access to your site… and setting up a blog/website is much easier than you think. And what is a blog anyway? It’s simply a website. Don’t be confused about the terminology. The technical definition of a blog is a web log, or an online diary, which is perfect for writing about any type of activity you may want tell people. And because of the way blogs are structured, they are perfectly optimized for search engines, so websites like Google and Yahoo can find your content easier. One of the most popular blog platforms in use is WordPress. WordPress makes it simple to categorize your content, relate web posts to each other, connect with other social media accounts on Pinterest, Twitter, and Instagram, and it comes with a built in search engine so users can find additional information on your site. You can also create web pages of static content (like an about me or an faq page). And, if your site becomes successful enough, you can actually make money from the blog by selling advertising space or products. So, what are the steps? For your hosting needs, we strongly recommend using Bluehost.com. Why Bluehost? Good quality, good service and a good price. Plus, like most places, you can buy a domain name and your web site at the same time. First Step, go to Bluehost.com and click on the green Get Started Now button. On the next page, you’ll be presented with 2 options for a establishing a domain name/web address. If you do not have a web address already, select the first option (New Domain.. please remember, your web address must be unique or not exist already). If you do have a web address/domain name, chose the second option. On the following page, you’ll fill out your contact information and your billing information as well. After you complete your billing and contact information, on the next page you’ll be presented with a few extra options. Here are the only things you need to be concerned about in the package information area. If you want your contact information related to your web address to be private, click on the Domain Privacy Protection option for an extra 9.99/yr. Please remember, this is optional. After you’ve purchased your Bluehost.com account, you’ll need to install WordPress on your site. WordPress is a content management system that will allow you to run a website without needing a designer or a web developer. In order to install WordPress on a bluehost account, check out the video below. It takes about 5-10 minutes to complete the setup and once it’s installed, it’s ready to go! There are a number of free templates out there, but in order to make your site really work for you, you need a good quality customizable template. For free themes, you can find several on WordPress.org, but most aren’t as optimized or well thought out as the themes you would find on some of the other sites listed below. If you want the ability to really customize your website, you should pay for a good template… it will be worth it for you in the end. With a good template, most of them can be customized enough for use on multiple sites and each site can look distinctly different depending on how you use the template’s options. So, if you’re losing weight or even exercising, build a website and tell the world about it. You can help others by sharing your story. It shows people that weight loss is possible and that they are not alone on their weight loss journey. Let me know when you get your weight loss blog up and running. I’d love to stop by and check it out. Tell the world about your blog via the social media channels you use, email your friends or just maintain it anonymously. It’s your choice. If you have problems with the wordpress installation, there’s a great video here. That is awesome! Stay focused and motivated!!!! Just checking in…how’s your weight loss coming along? Thanks for the information. It is very interesting and good stuff! Thanks for this post. I have started my blog. It isn’t a weight-loss blog per se because I don’t have a lot of weight to lose (less than 20 lbs). It is however a chronicle of my journey to healthy eating and living, and also serves to provide accurate nutrition as opposed to what Conventional Wisdom and “Nutrition quacks” tell us. I want to lose weight, but dont know how. I’m addicted to food and I hate myself. I want to be free. I want to live.!!! Mrs. Linda i just read ur post and it touched my heart.. I FEEL THE EXACT SAME WAY!!!!!!!!!!!! You see i am 130lbs overweight and it caused me serious health problems..And people look at me in disgust sometimes…Men always look at the smaller women and not the big ones like me…and i wake up crying and i go to bed crying…IT IS SURELY A MISERABLE FEELING TO BE HEAVY!!!!!!!!!!!!!!! I LOVE FOOD!!!!! Fast food, junk food, i love it and MY PEPSI..WOWWW IS MY FAVORITE!!!!!!!!!! I ALWAYS EAT AND THEN I SEE SOMEONE POST A WEIGHT LOSS SUCCESS STORY AND I GET DEPRESSED AND I START EATING AGAIN..I ALWAYS SAY, “GOD I HATE MYSELF”!!!!!!!!! I SAY THIS EVERYDAY… WELL MRS. LINDA..IT IS EASIER SAID THAN DONE WHEN SOMEONE SAY ALLWE HAVE TO DO IS STOP EATING….I DONT WANT TO HEAR THAT BECAUSE IF IT WAS THAT EASY I WOULD HAVE STOPPED BY NOW!!!!!!!!!!! wE HAVE TO GET TO A POINT WHERE WE SAY, “I LOVE MYSELF ENUF TO WANT TO LOOK GOOD AGAIN”! WE HAVE TO GET TO THE POINT OF “WANTING” TO CHANGE AND THAT INCLUDES REACHING OUT FOR SUPPORT SOMETIMES!!!!!! I DECIDED TO TAKE WHAT I LOVE TO DO AND TURN IT INTO A WEIGHT LOSS JOURNEY! I LOVE TO EAT SO I NOW SUBSTITUTE CERTAIN FOODS FOR BETTER ONES AND I TAKE HEALTHY SUPPLEMENTS TO HELP ME STAY BALANCED.. I LOVE TO SCRAPBOOK SO I TAKE ALL SORTS OF PIX OF MYSELF NOW AND WILL MAKE A WEIGHTLOSS JOURNAL….. I DO SMALL THINGS LIKE WALK A LITTLE MORE AND DANCE A LOT FOR FUN…. HAVE U EVER BEEN IN LOVE? WHEN U ARE IN LOVE YOU WILL DO WHATEVER YOU CAN TO MAKE THAT PERSON HAPPY…YOU LOOK AT THAT PERSON WITH THAT, “SPECIAL LOOK”, AND U MAKE THE BEST CHOICES FOR THAT PERSON, AND U ALWAYS TELL THAT PERSON THAT YOU LOVE THEM….WELL WE NEED TO FALL BACK IN LOVE WITH “SELF” START LOVING YOURSELF TO THE POINT WHERE U WILL DO THE BEST FOR YOU!!!!!!!!!!!!!!!!!! NO ONE WILL LOVE YOU LIKE YOU CAN… PRAY AND ASK GOD FOR STRENGTH AND I PROMISE HE WILL GIVE IT TO YOU…I AM TAKING MY WEIGHT LOSS JOURNEY ONE DAY AT A TIME..I DID NOT GET FAT OVERNIGHT AND I WILL NOT LOOSE IT ALL OVERNIGHT…BUT I WILL HAVE FUN IN THE PROCESS BECAUSE WHEN YOU MAKE IT A FUN JOURNEY, IT BECOMES EASIER!!!!!!!!!!!!!!!! I WILL KEEP U IN MY PRAYERS MS. LINDA EVERYDAY AND I KNOW YOU WILL MEET THAT SMALLER PERSON INSIDE OF YOU VERY SOON!!!!!!! I HAVE FAITH IN YOU…YOU CAN DO IT BECAUSE YOU WERE BORN TO WIN…YOU WERE BORN TO SUCCEED, NOT FAIL…YOU ARE A WINNER IN JESUS NAME…..GOD BLESS YOU!!!!!!!!!!!!!! WOW!! You ladies have me in tears. I too struggled with being overweight and to me it seemed like it happened overnight. I began to get depressed and did not like who I was because I felt ugly. I was not used to being like that and I knew I had to do something about it. I literally would have asthma attacks from walking up a flight of stairs in my house and then had to move my bedroom to the main floor. Fast forward….I have gone from 222 lbs to 174 lbs / from size TIGHT 18/20 to a 12 and I AM LOVING ME AGAIN!! Most importantly I have now learned to love myself regardless of how my outside may appear. Very well said! I totally agree, I had to fall back in love with ME! THE MOST IMPORTANT PERSON I KNOW! So many ppl depend on me. The 1st thing I did was went and bought post it notes and placed them all over my house like the bathroom mirror saying “good morning beautiful” or the fridge Saying “Jacinta THINK before u open me do I really want something out of here or AM I JUST BORED” This actually helped and also take yourself on dates. I mean really get dressed up like u were going out with a man! And treat yourself like a queen you will begin to feel better which in turn will make u want to look and do better. I hope the advice helps you guys. NO MATTER WHAT U R BEAUTIFUL! I just read the last two comments and my heart goes out to you both. I lived where you both do and no it is not pleasant. I am still heavy and have my moments of sadness, but have made a decision to not allow it to overtake my life. I have been overweight since I was nine years old and have well over 200 lbs to lose. I know all too well the looks of disgust and horror that people give you and again have decided thats their problem. I have tried to lose weight for all the wrong reasons, to be accepted, to make others happy and hopefully for them to leave me alone about my weight and so on and so forth. Well I have decided to go on a weight-loss journey and to take it one step at a time and just to make better decisions for my life. I would like to invite you to join me. 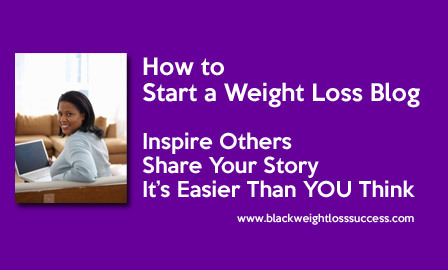 Let’s become part of this community to journal our weightloss and draw inspiration and motivation from each other. Remember from your greatest struggle comes the greatest deliverance of yourself and others. God Bless You in all you do! Great information. I’ve been looking for a forum to share info and perhaps serve as an inspiration to other black woman who are/were in my circumstance. Through diet and exercise (and God’s grace), I’ve managed to lose 103 lbs over the last 18 months. I’m planning to lose about 75 more in the next year and a half. I would love to start a blog to help other sisters to know that a age 50+, morbidly obese, depressed, stressed out mother of 2 CAN dig deep to change her life and feel righteously good again! I feel amazingly strong and energized. Keep the good information coming and I’m going to keep plugging away on my journey. Great!! Check out our blog http://www.blogawaytheweight.com as well! At 57 years old I too am on a journey that started many years ago. From 299 lbs to 277 lbs; I am now 255 lbs and still losing. In home walking dvds, lots of water, portion control and common sense are my primary weight loss tools. Fruit is a healthy snack. I have learned to love them. When I fall off the wagon ( once or twice a week) I just dust myself off and continue to trudge forward. I have found that more days on than off can still yield a success rate. My motivation to myself and others is NEVER GIVE UP! Wow! I think we all have something in common. I am so sick and tired of being morbidly obese. I am tired of making excuses and tired of not being able to do things that others can do (just walking a short distance, standing longer then 5 minutes, etc.) I want my mobility back, shucks I want my life back. I am 56 years old and have chronic lower back pain. In January 2013, I went to the spine surgeon to ask what can be done and he said absolutely nothing as long as you are carrying that weight. He said I have tied the medical professions hands because I was such a high risk. I also have chronic gout, high blood pressure, high cholesterol, chronic kidney disease and the list goes on and on. What a painful revelation that was. My biggest problem is I am addicted to food. I just want to eat everything that looks and taste good and I use to eat in very large quantities. However, after the visit to the spine doctor, I decided I wanted to live and I immediately started eating smaller quantities, oh I was losing but not much. and that did not stop the gout flare ups and other health issues. In mid March I became a vegetarian. The only thing I eat from and animal is milk, cheese, and eggs. Sometimes butter but rarely. My weight began to come off. I am currently down 50 pounds, I have not had a gout flare up since becoming a vegetarian, my joints feel better, my hiata hernia feels better, my energy level has increasesd and my kidney problem (protein spillage) has decreased. I read your blogs and I know this may not be for everyone but it is helping me so much. Even my complexion is clearing up, the dark circles under my eyes are going away. Reading this blog is such an inspiration and I want to continue blogging to get me through this one day at a time. So I am with all of you, With God and you all,I know I can do this. I hope my journey can be an inspiration to others. Ladies, I am reading your comments here and I so relate. I’ve struggled 35+ years on diets off diets, on diets, going off diets… “Diets don’t work.” It was a constant yo-yo… I would lose a little weight and gain it back plus more… I began experiencing shortness of breath, aches and pains in my legs, feet, back… In Feb of 2012 I received info about JJ Smith via facebook, author of “Lose Weight Without Dieting Or Working Out!” I read her book and it totally shifted my mindset as I related to food. I learned that being overweight was not my fault… I forgot about how I use to eat and completely decided to follow JJ Smith system she outlined in her book called, “The DEM (Detox, Eat, Move) System. I lost 70lbs in 2012 on her system and I lost 30lbs the previous year in 2011 for a total of 100lbs. Today, I seem to be maintaining the weight loss, but I still have more weight to lose to reach my goal; at least an additional 70-80lbs. I want to encourage everyone who “wants to” lose weight will lose weight. See, I had another encounter in Feb 2012 at a Curves facility, I heard myself saying when asked to do the circuit machine workout one more round (I was tired) the trainer asked me, “Are you just too exhausted to go around a second time or is it that you just don’t want to?” I replied, “I just don’t want to”; I heard me say in my own words why I’ve struggled all those many years… “I didn’t want to bad enough…” When I heard me say those words it was at that moment I realized I had to “want to”. I tell everyone, if I can do it (lose weight – anyone can lose weight) Yes, you all can do it; yes we can. I can understand your frustration, still trying to lose the same 30lbs it seems for a year. Have you kept a food diary? First time I did that it was a shock of what I was eating compared to what I thought I was eating. I was suggested this blog by my cousin. I’m not sure whether this post is written by him as no one else know such detailed about my problem. You’re incredible! I’d love to have you check out my blog. I’ve lost over 90 pounds but I blog daily about my struggles to get to my goal of 135. This is awesome! Me and my entire family have changed our lives tremendously after realizing how much weight loss and living a healthier lifestyle can do for you! I tried every diet possible and nothing was working for me! My sister and mother were bother over 260 pounds and I had to find something because I wanted them as we’ll as myself to experience life! Advocare and crossfit changed our lives!!! I recently started my own weightloss blog. It is a part of a project that I am doing for school, but it is something that I have wanted to do for quite some time. Content is thin because of school right now, but I plan on taking it further and writing more when I finish this class. I’m glad I found this site because I’ve been wanting to connect with other black women who are trying to lose weight. I’ve lost seven pounds since I started the blog but I need to lost at least 100 more so it will definitely be a well documented journey. Good luck to each of you on your own journeys! Thank you so much for providing this information. I am trying to start a blog and have experienced difficulty in determining the best social media site to use. I looked on WordPress to start my blog and became overwhelmed with the process. Thank you for sharing and I will take this as a sign to push through and get it done. Check out the hosting companies above for easy installation of WordPress. You should also consider more than one WordPress theme and get the one that is easiest for you to customize. There are tons of free themes out there too. Great and Informative Post! I also believe that starting blogging and sharing the weight loss journey experiences with the public makes our more committed to the goal. I was so surprised about how much support I fond from blog readers. A really interesting guide to start a health blog.you could begin sharing some simple medicines, discussing health concerns and remedies, some home made treatments, common herbs that could be simply available in any kitchen and the one that works like wonders. Great and very concise post, I wish I had found this sooner it would have made my life much easier. Weightloss will always be a topical blog subject whether you are fat or thin. The more help and information available on healthy diet tips the better. Wow! Thank you so much for sharing this information! Many blessings to you! I literally just launched a brand new blog for the first time to document my weight loss journey and share some tips along the way. I’m currently 38, and I have a goal of being in an amateur bikini contest at age 40. I have ALOT of weight to lose and blogging will be my attempt to keep myself accountable. I follow BWLWS on IG as well as some other inspiring pages. Seeing all these success stories make me hopeful! I, too, am using Word Press and have found it to be fairly user friendly. There is an abundance of tutorials on YouTube to assist with the set up. It’s certainly a learning process, but I’m excited to see where this personal experiment will lead me! I can be followed on my blog at fitchroniclesbysaph.com.